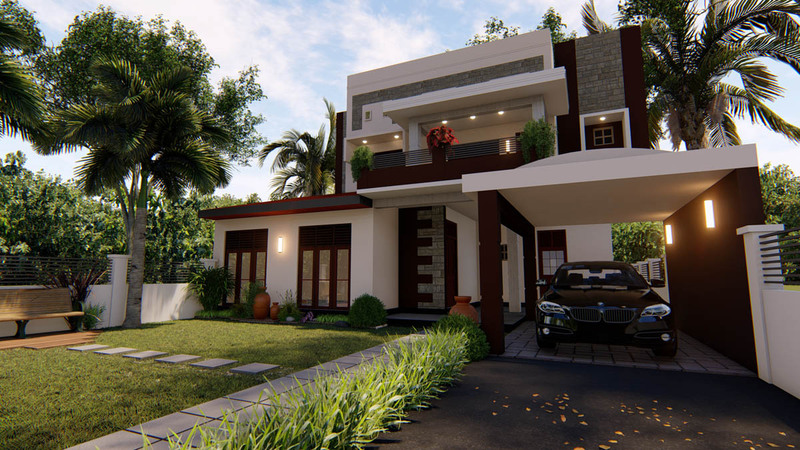 We are proud to introduce ourselves to you as a home designing and construction company in Sri lanka with an excellent reputation and our objective is to help the people in their need of building a house of their own with a limited budget. We have earned a good experience through last 24 years and ready to share it with you at a very low cost. One of the most important requirements of a human being is a shelter of his own. But we have noticed that most of the people who have completed their house are not satisfied with what they have done. It is because they have no enough knowledge and experience in the field of construction. But you are fortunate to have a reliable and experienced partner to help you build your dream house. We can show you the best and correct path which you should take to reach at the successful end of construction of your dream house. Make the best design to your land. (Particularly designed to your land considering your requirements.Not a copy of any other plan). Build your house using low cost methods. Select suitable furniture and finally make you a happy owner of a beautiful home and a life. If we build your house we shall do your BOQ and other required drawings absolutely free. Your building plan will be specially designed for your requirements and situation of your land. We shall help you get your bank loans. You can pay for your house in installments. You will get engineering and architectural services free. You will get the free service of vasthu specialist. If you are interested in using cost effective method we can introduce you the following. Concrete door and window frames. This is ideal for any house or any building. 2 inch thick composite slab is very suitable for any number of floors. We have used this slab very successfully for houses, stores, shops, and schools. Two inch thick concrete slab is laid on pre-cast, pre-stressed concrete beams and reinforced with 2”x2” GI mesh. Some people think that this slab is not strong enough as its thickness is only 2 inches. But we should not forget that the slab is on pre-cast beams laid at 24 inches. It is cheaper than the conventional slab. Its weight is less than a conventional slab and therefore you can reduce the cost of beams, columns and foundation. It takes very little time for construction and you need not to wait till shuttering is removed. You can lay the slab room by room and you can build even a part of the building. We have been using concrete door and window frames for a long time now. It is an ideal alternative for timber frames and it also helps keep the country green. Cost of a concrete frame is very less than that of timber frames. You can buy a best quality concrete door frames between Rs.1500.00-2000.00.While you should pay about Rs. 5000.00 only for timber for a door frame without labour charge. If you want to get timber look, concrete frames can be either painted or polished just like timber frames.